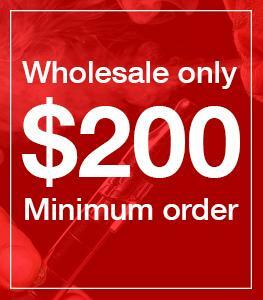 Wholesale dab rigs accessories are an easy up-sell for any customer that purchases a dab rig from your store. Most customers will be happy with the standard nail and dome that come with their oil rig purchase, but upgrading them can make for a smoother dabbing experience, and add to your bottom line. Quartz is by far the number one selling dab rig nail material on the market. It makes up the bulk of the nails sold today in the US. Quartz. Quartz is used because of it's even heat, and it's ability to retain high temperature for extended periods of time. It is preferred for connoisseurs because it offers a smooth dab, and the quarts doesn't make the concentrates taste different than they were intended. Ceramic Nails are made of ceramic materials that can handle very high heats. The down side of ceramic is that it doesn't hold heat as long as quartz, or titanium, but it also is an inert material that doesn't impart a taste on your dabs. Titanium has long been a staple in the dab accessories market. Titanium offers an almost indestructible nail that if kept clean, you can use for decades. For easy cleaning you can use your torch and over heat the nail to burn off any excess residue. Dabbers are nothing more than a tiny shovel that help you scoop up your concentrates onto your nail. Depending on the size and type of dabber you may be able to scoop up grams at a time. Dabbers will come in varying lengths, shapes, and be made of many different materials. Just like nails dabbers will come in quartz, ceramic, and titanium, but also stainless steel, silicone and pyrex glass are popular choices. Dabbers can come with different types of points, or ends. Some will have an actual point on it like a dental tool, while others have a shovel shape for scooping large amounts of concentrates. No matter the style of the dabber the goal remains the same, to place your dabs onto your nail. Stainless steel dabbers have surged in popularity in recent years. Mostly this trend is due to the lowering of the price for stainless steel dabbers. They offer an alternative to more expensive titanium, but there is no guarantee of the purity of the metal. For this reason seasoned dab professionals shy away from stainless steel dabbers. Silicone tipped dabbers, which are usually made of stainless steel, are an advancement in the standard design. The ends of the dabber have silicone tips that slide over the stainless steel. Since silicone is non-stick this makes for an easier transfer of your dabs to the nail. It is much easier to keep clean than stainless steel, and they usually come in an array of colors. When you sell an oil rig it will typically come with a glass dome and nail. These domes are made of pyrex glass, but tend to be just clear. For an add on sale you can upgrade your customer to a more detailed dome. Glass domes can come in many different designs. They can be a solid colored glass like black, green, amber, or blue, or they could be full wig wag or inside out. Glass domes don't just have to come in those blown out bubble shapes. Straight domes have a cleaner look, and are easier to use. A straight dome with a slanted top makes it easier fro you to dab as inserting your dabber into the dome is easier to achieve with the slant top. We all know that concentrates come in a container when you buy them. Those containers tend to not be the most sturdy, or well designed. They are for looks and to abide by local laws. Silicone containers offer an easy to clean way for your customers to store their concentrates. Silicone is a non-stick material that can come in any color under the rainbow. They can be customized with a company logo, or be plain. These are sold in ml sizing. Standard sizes for them are 3ml, 5ml, 7ml, 9ml, 12ml, 15ml, 20ml, 25ml, 30ml, and 50ml. These may be a single container with only one storage compartment, or they could have many different storage compartments. The multi-compartment silicone containers make sense for people who like to have a variety of dabs. You can store different dabs that can be used for different times of day, or rotate them throughout the week. The 7 compartment lego silicone container is one of the most popular storage options. They have a lego type pieces on the top and bottom so they can be stacked and stored very easily. Carb caps help to regulate the flow of air into and out of an oil rig. When up-selling your customer to a quartz banger, adding a carb cap can increase sales with ease. Suggesting a quartz carb cap is a logical suggestion when talking with a customer. It doesn't seem to pushy, and the benefits tend to out way the cost. For precise air flow, and a better dabbing experience, a carb cap is a must for any seasoned dabber. Carb caps come in all the same materials as most other products. Quartz, ceramic, titanium, and glass will be the most common materials used to make carb caps. Some will have air holes for controlling air flow, while others will need to be manually adjusted during your dab session. Choosing the right dab rig accessories can help to make your customers happier and keep them in your store instead of straying tot he competitions. Suggesting to right add on items when a customer purchase a rig can also help you stores bottom line. Pyrex Glass Flower Bowl 10mm Female Joint Fits 10mm Male Joints Glas..
100% Solid quartz 10mm Female Joint Fits 10mm Male Joints 4mm Thick ..
100% Solid quartz 10mm Female Joint Fits 10mm Male Joints Double bucket Ther..
100% Solid quartz 10mm Male Joint Fits 10mm Female Joints 4mm Thick ..
100% Solid quartz 10mm Male Joint Fits 10mm Female Joints Double bucket Ther..
Pyrex Glass Oil Dome Replacement Straight Style 10mm Female Joint Fi..
100% Solid quartz 14mm Female Joint Fits 14mm Male Joints 4mm Thick ..
14mm Female Quartz Banger 4mm Thic..
100% Solid quartz 14mm Male Joint Fits 14mm Female Joints Domeless 4..
Pyrex Glass Drop down 14mm Male Joint x 18mm Female Joint Fits 14mm Female g..
Pyrex Glass Oil Dome Replacement 14mm Female Joint Fits 14mm Male Joints..
Pyrex Glass Oil Dome Replacement Straight Style 14mm Female Joint Fi..
Pyrex Glass Flower Bowl 18mm Female Joint Fits 18mm Male Joints Glas..
100% Solid quartz 18mm Female Joint Fits 18mm Male Joints 4mm Thick ..
100% Solid quartz 18mm Female Joint Fits 18mm Male Joints Double bucket Ther..
100% Solid quartz 18mm Male Joint Fits 18mm Female Joints 4mm Thick ..
100% Solid quartz 18mm Male Joint Fits 18mm Female Joints Double bucket Ther..